Our highly trained pressmen have printed just about every combination of ink on paper you can imagine. When you print with us your project is going to be outstanding! Our production facilities have a wide variety of top of the line equipment. For your printing needs, we have a full line of 1-2-4-5 color presses. Most importantly, over many years of being in the business, we have become well acquainted with the specifics of producing advertising materials for certain industries. Airline, food and beverage, and money transfer are just a few examples of these markets. 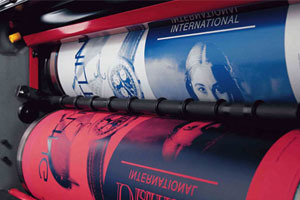 Offset lithography is a great cost effective way of creating printed materials. A few of its common applications include: newspapers, magazines, brochures, stationery, and books. Compared to other printing methods, offset printing is best suited for economically producing large volumes of high quality prints. Our modern offset presses use a computer-to-plate system work flow, which further increases their quality. ability to adjust the color ‘on press’ for precise and consistant color control.